Twenty-five years ago, weeks of student led, pro-democracy demonstrations in China ended when tanks rolled in to Tiananmen Square on June 4, 1989. Thousands were arrested, and estimates of the death toll range from several hundred to several thousand. At the time, America’s relationship with China was very different than it is today. Before that event, the American public generally had a favorable view of China, and as the Tiananmen protests unfolded, most Americans wanted to show support for the pro-democracy movement. But in the years since, economic ties and economic competition have become the dominant topics between the two nations, while at the same time the relationship has become more distrustful. The events at Tiananmen grabbed the American public’s attention and seemed to shift Americans’ views of China within a short period of time. Just months before the massacre, a Gallup poll found 72% of Americans expressing a very or mostly favorable view of China, but this plummeted to 34% by August 1989. About half of Americans in a July 1989 Times Mirror survey said they had seen the now iconic photo of a lone demonstrator standing in front of a column of tanks on Beijing’s Chang’an Avenue. Today, the relationship between the two nations is dominated by a narrative of economics; the two are major trading partners, but also economic competitors. Around the world, many people see the economic balance of power shifting, with China on the rise and the U.S. in relative decline. And over the long run, people across the globe believe China will supplant the U.S. as the world’s dominant power. A 2013 Pew Research survey of 39 nations from around the world found that in 23 countries majorities or pluralities thought China either already has replaced or eventually will replace the U.S. as the top superpower. Americans are concerned about the economic threat from China, and their top worries about China revolve around economic issues. 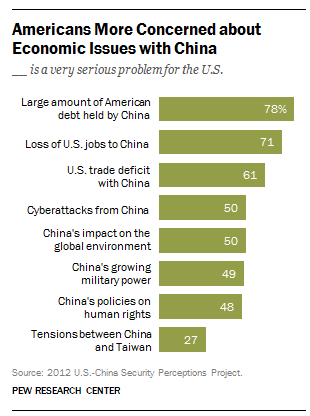 When respondents to a 2012 Pew Research Center/Carnegie Endowment for International Peace survey were asked to rate potential concerns about China, the top three issues were all economic: 78% described the large amount of U.S. debt held by China as a very serious problem, 71% said this about job losses to China, and 61% felt this way about the trade deficit with China. Cyberattacks, China’s impact on the environment, its growing military power, and its human rights policies were all rated lower, although these issues generated strong concerns among many as well. Just as in 1989, Americans continue to have a mix of goals related to China. They want to show strength and to stand up for American ideas, but they also want a good relationship with this emerging power. In 2012, 55% believed it was very important to build a strong relationship with China. But a similar number (56%) said it was very important for the U.S. to be tough with China on economic and trade issues. Even so, a quarter century after Tiananmen Square, it’s clear that China’s human rights record remains important to Americans. Just over half (53%) said it was very important for U.S. foreign policy to promote human rights in China.